One free ticket each day during the promotion period. Earn additional tickets for every 100 tier points. Winners receive $100 free play and everyone playing at the winner’s slot bank or table wins $25 free play! * Must be playing with your Players Club card at the time of drawing to receive a prize! Winners have 40 seconds in the money machine to grab as much cash as possible! • $1,040 up for grabs each drawing! Earn 100 tier points for your scratch card! *Limit 2 scratch cards per Thursday. Scratch only 6 spaces and reveal your prize! Trade-in your non-winning Powerball and MegaMillions tickets for BHCR Free Play. Receive $5 Free Play per Ticket! *Limit 3 ticket redemptions per Tuesday. Visit each week to collect the set! Must receive promotional postcard and be in the eligible group to receive gifts. No reservations. Earn 50 tier points to get your Powerball or MegaMillions tickets. *Limit 5 ticket redemptions per Tuesday. THE MONTH OF YOUR BIRTHDAY! Visit us any time during the month of your birthday to reveal your free play prize! PRIZES UP TO $25 FREE PLAY! 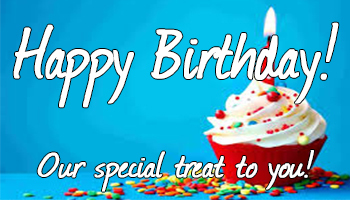 Get a FREE dessert at Firesides or Cowboy Cafe on the day of your birthday! Sign-up for the BHCR Players Club card and receive $100! Receive $10 Free Play and $10 Free Food on the day you sign-up. Plus, receive the same offer for your next 4 visits! For complete details on all our promotions, please visit our Players Club / Cashier.